The 2018 national traditional rowing contest opened in Phan Thiet city of the central province of Binh Thuan on June 10. 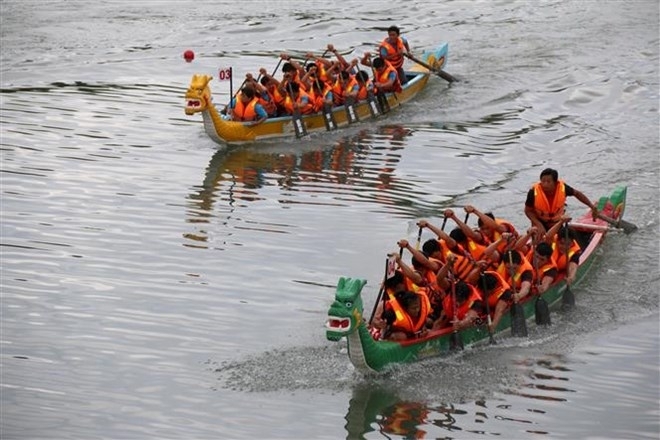 The two-day competition is co-organised by the Vietnam Canoeing, Rowing and Sailing Federation and the Department of Culture, Sports and Tourism of Binh Thuan province. It draws the participation of more than 100 athletes from six localities of An Giang, Hai Duong, Quang Binh, Ho Chi Minh City, Dak Nong and Binh Thuan. The athletes will compete in three events of 200m, 500m and 1,000m. The traditional rowing contest, part of the national tournament system, offers chances for rowers to sharpen their skills and share experience. It also facilitates the preparation of upcoming regional and international competitions. The team from Hai Duong province triumphed in the men’s 1,000m race for 12 rowers right after the opening ceremony.